With their hard-edged, street-wise prose, they created frighteningly probable futures of high-tech societies and low-life hustlers. Fans and critics call their world cyberpunk. Here is the definitive "cyberpunk" short fiction collection. HC: Arbor House. Essential, and important, reading for fans or historians of the cyberpunk movement of the 1980's. MIRRORSHADES is a mixed bag of mostly good, though almost all dated, science fiction stories in the cyberpunk motif. 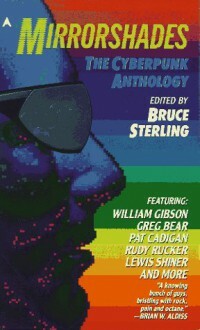 The definitive anthology of stories from the edgy and influential cyberpunk SF movement of the 1990's.